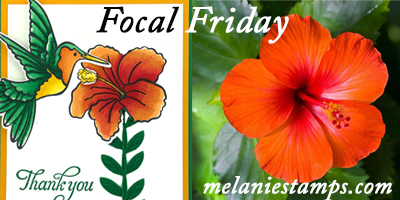 Each Friday I come to you with a photo or design idea for you to focus on over the weekend. 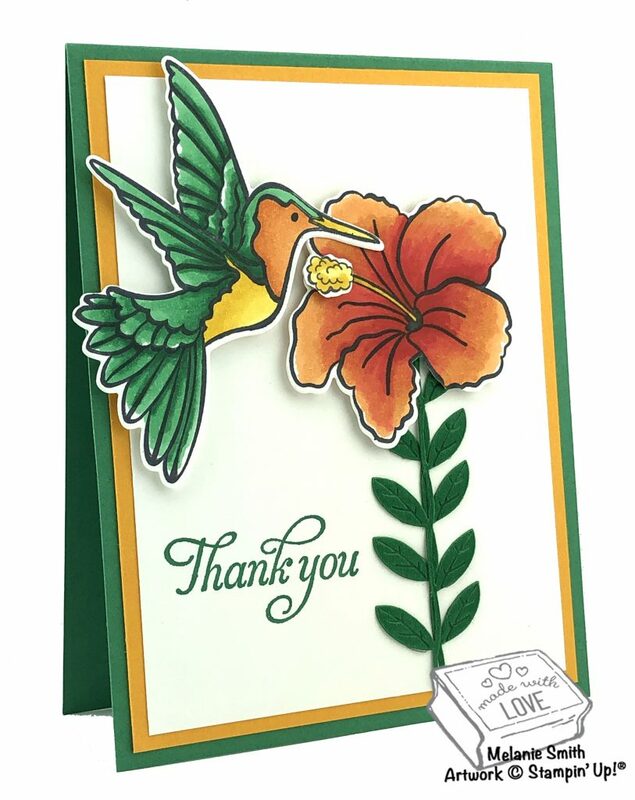 This week I fell in love with the Humming Along stamp set. I love the colors and of course the coloring. Lets look at today’s focal graphic. if you love it….PIN IT to Pinterest and help others with some color inspiration. My mom and I were blessed with two amazing holidays in Hawaii together and I will always treasure those memories. I wish we could go back but unfortunately that is not an option. 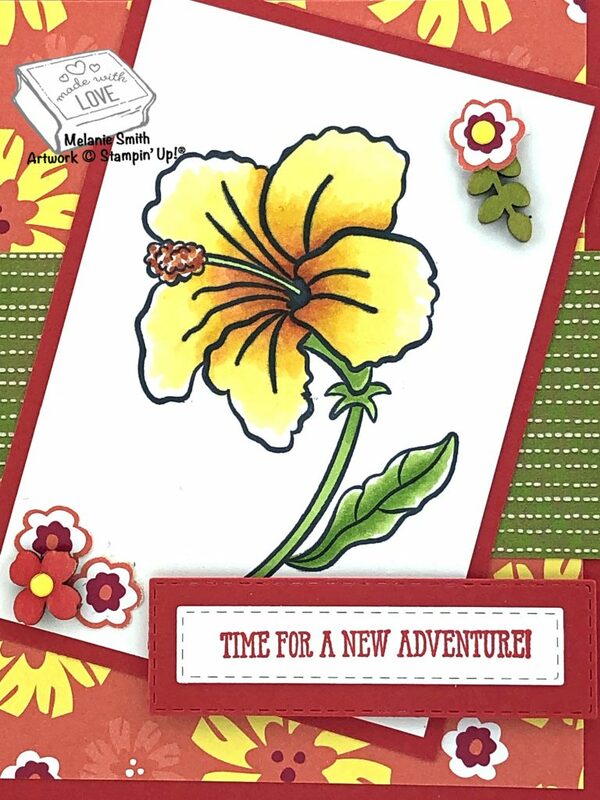 So lets go to Hawaii with our crafty projects this weekend…. I love doing these Focal Friday’s. They inspire me and I hope they inspire you as well. 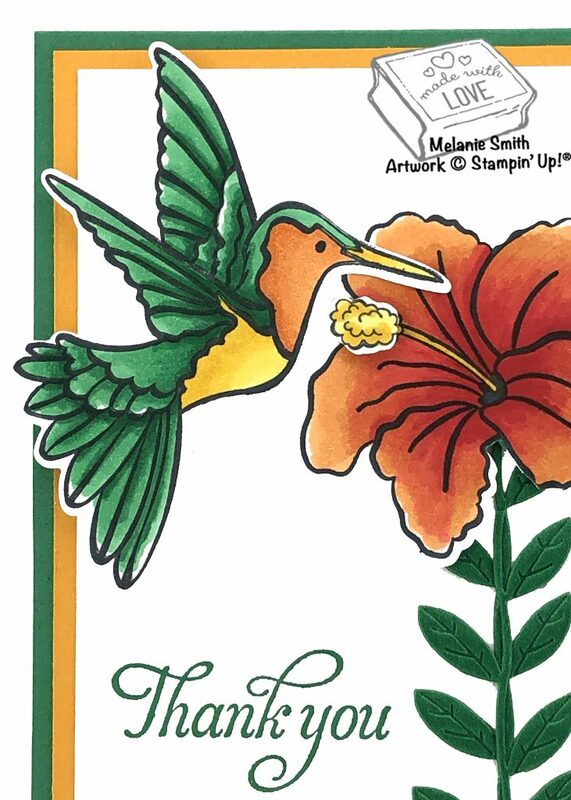 For this design I colored the Hibiscus flower using Stampin’ Blends Alcohol Markers. 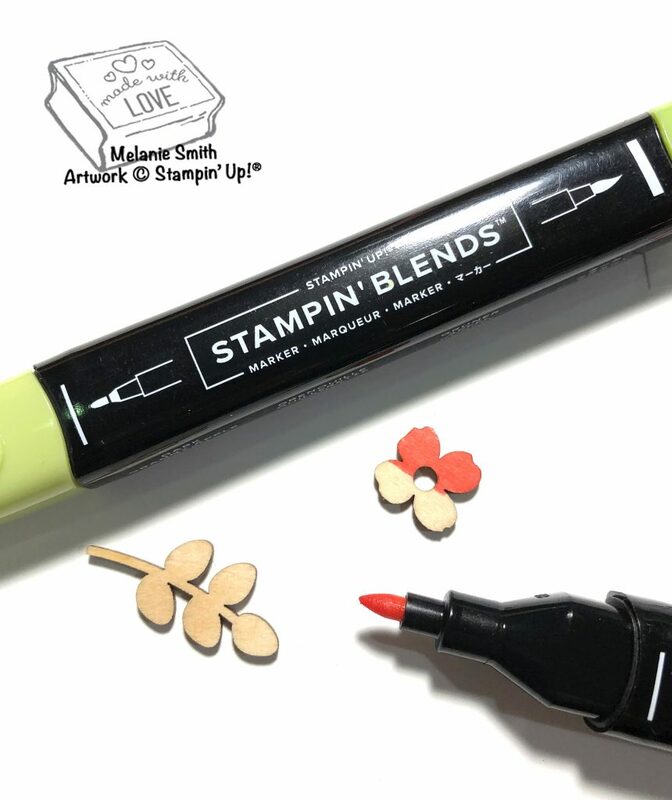 The beauty of our Alcohol markers is there is no guess work. Our markers come as a duo with both light and dark. So there is no guesswork. 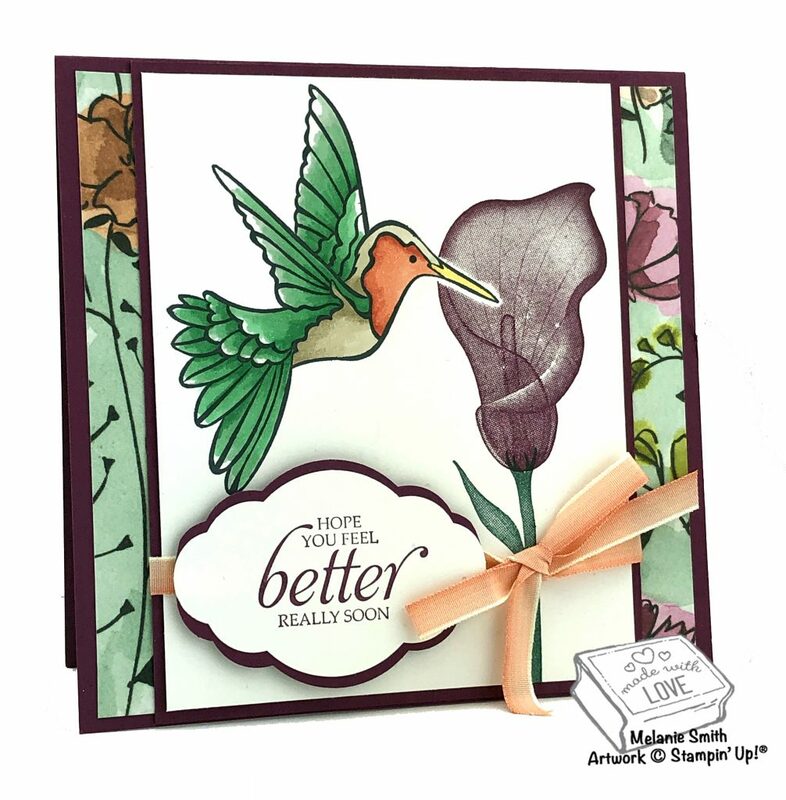 With layering you can create these beautiful shaded stamps. 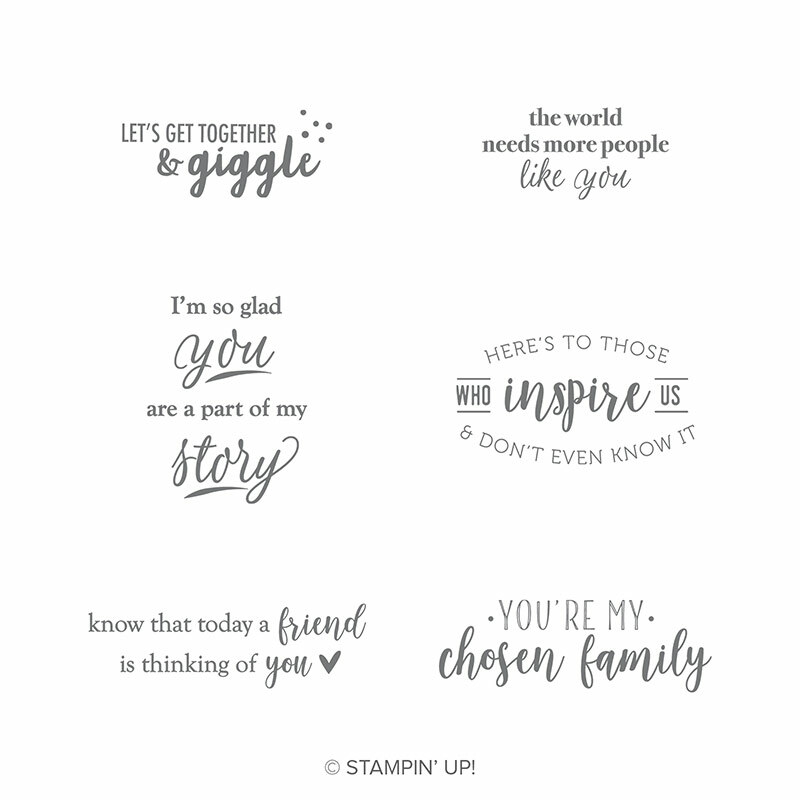 I used an array of Stampin’ Blends duos and I will link to at the bottom of this post. Check out this AWESOME vine I created using the Leaf Ribbon. I simply intertwined them together using mini glue dots to hold them in place. I love how this turned out. 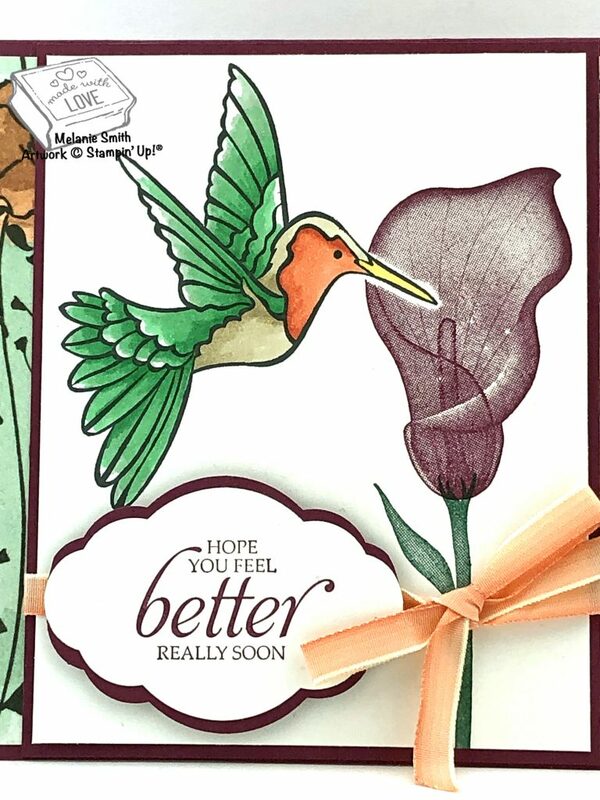 Hope You Feel Better Soon ~ Free Card!!! 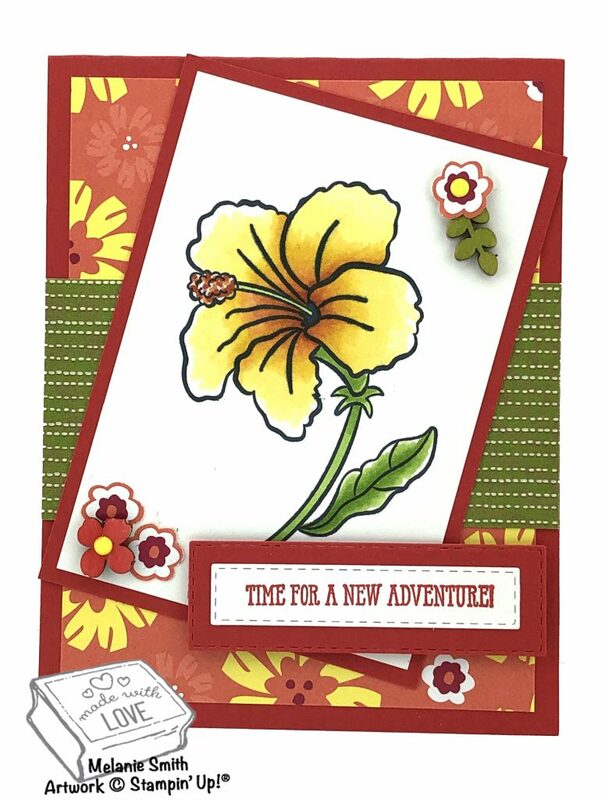 With this card I have mixed the Humming Along stamp set with this beautiful “Lasting Lilly” stamp set. It can be free for you with a $100 order during Sale A Bration. 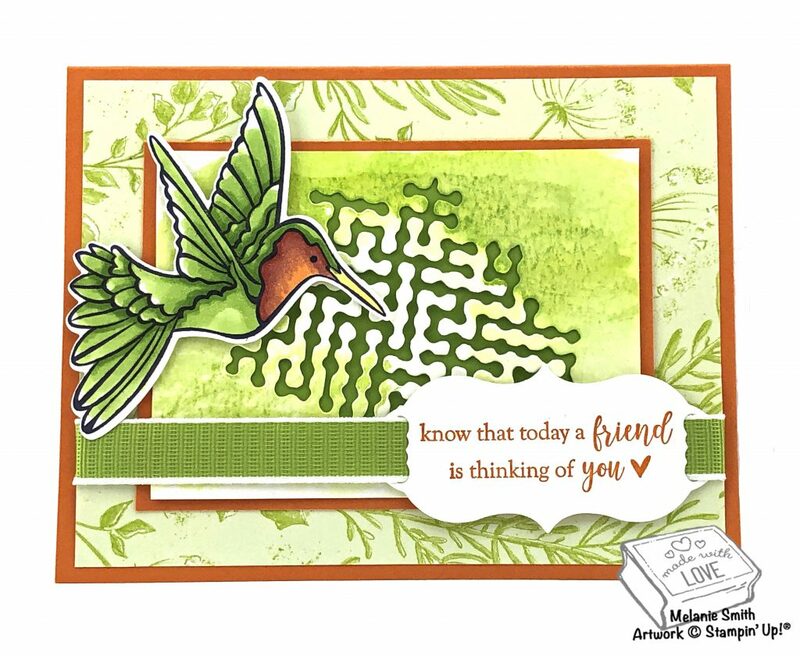 In March they will also have coordinating dies available for purchase, while supplies last. I have done a little masking here. If you are unfamiliar with the masking technique drop me a note and I will make sure to do a tutorial or Tuesday tip to show you how. 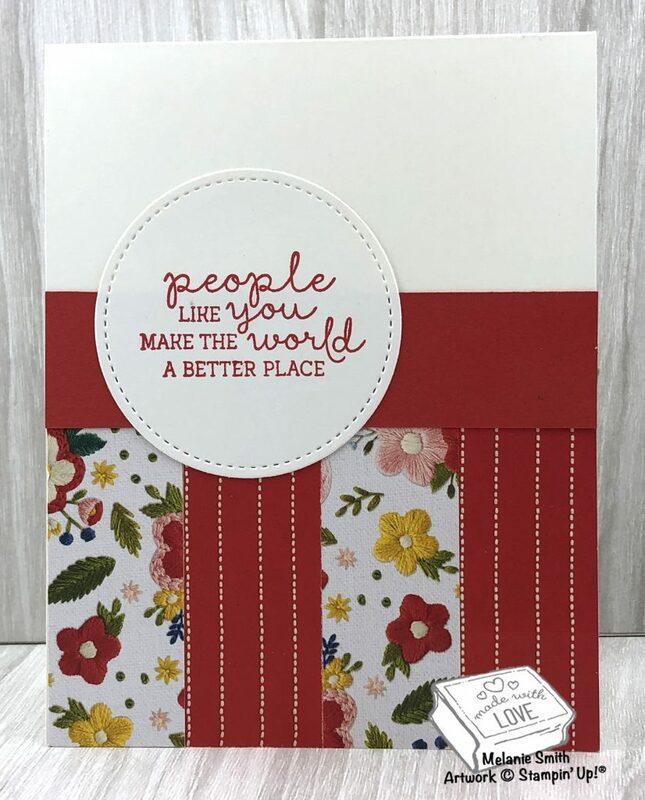 Isn’t the Pretty Label punch perfect for the sentiment? I am really loving this punch and have used it in numerous samples. 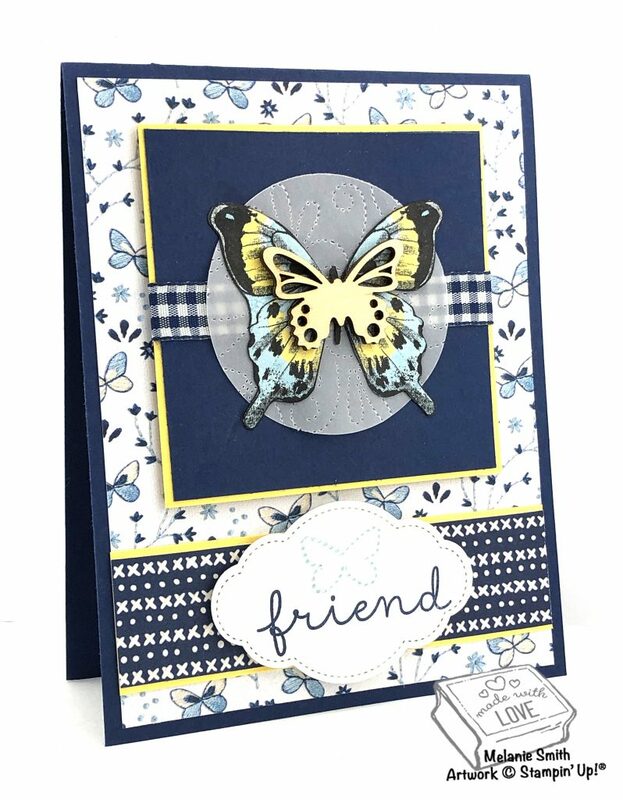 For this layered look simply cut your background card stock twice to achieve the border. I am always here to assist you in any product, design, or purchasing questions you may have. You can simply used the “Contact Me” area of the side bar or email me at melaniestamps@yahoo.com – I love getting messages, ideas, suggestions etc. from all of you. 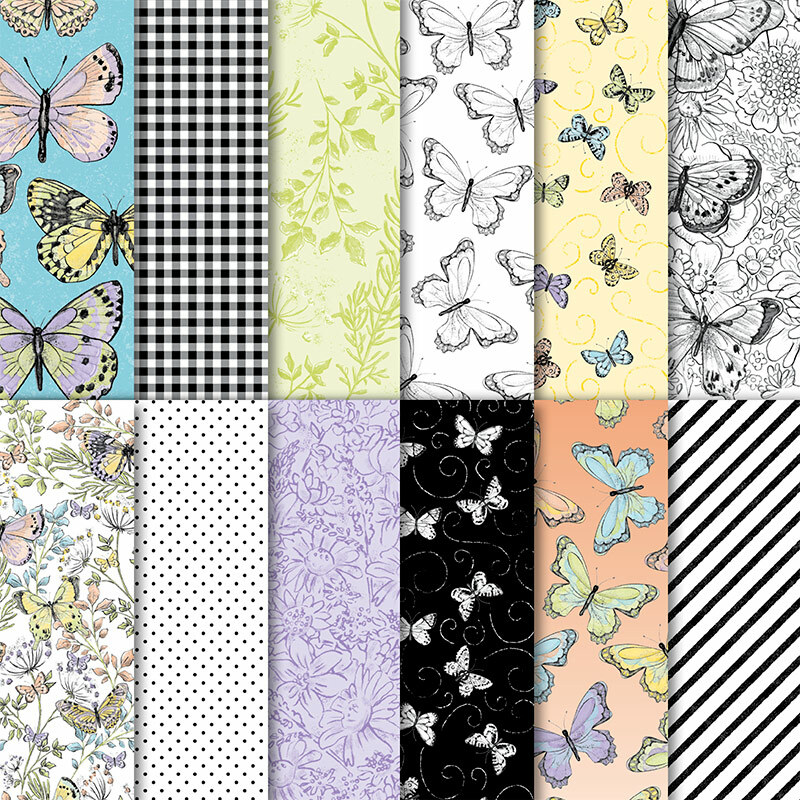 I have used the background die, which comes with this bundle. It was cut from watercolor paper and then I used some ink from the ink pad along with an aqua painter to create the background. 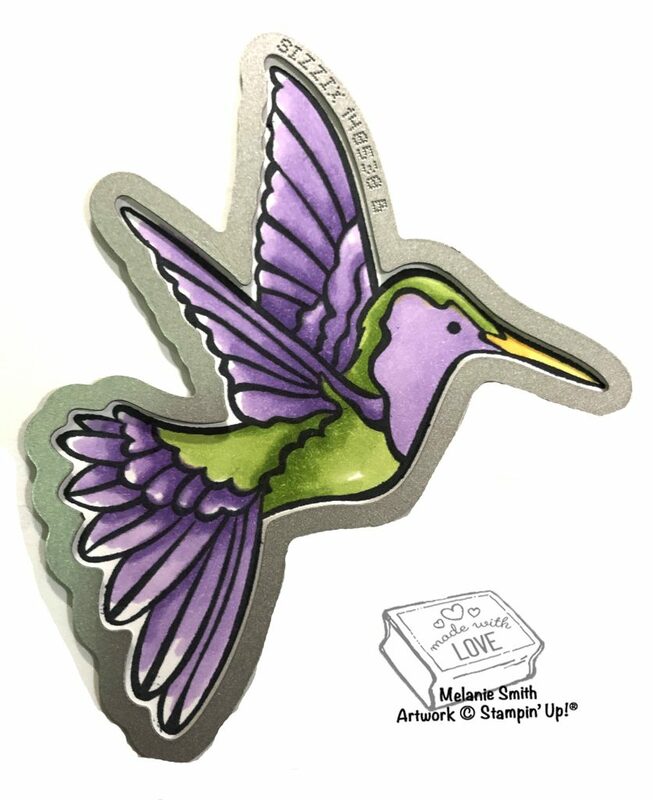 The hummingbird was colored using Stampin’ Blends. The body is colored with granny apple green and old olive. The throat is Pumpkin Pie with a little cajun craze. The Daffodil Delight for the beak. 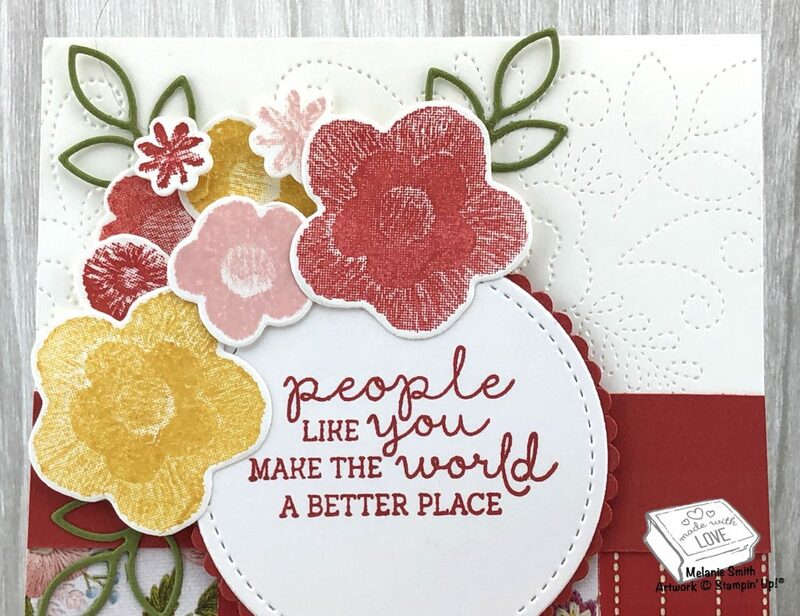 The sentiment is stamped on a label die in the bundle. 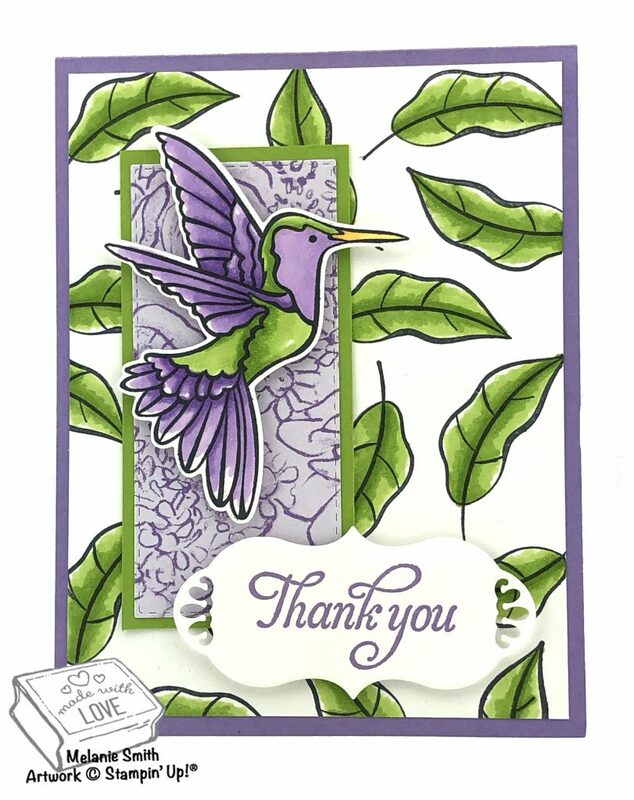 The sentiment is from the FREE Sale A Bration set called “Part Of My Story”. It is free with a $50 purchase from now until March 31st. 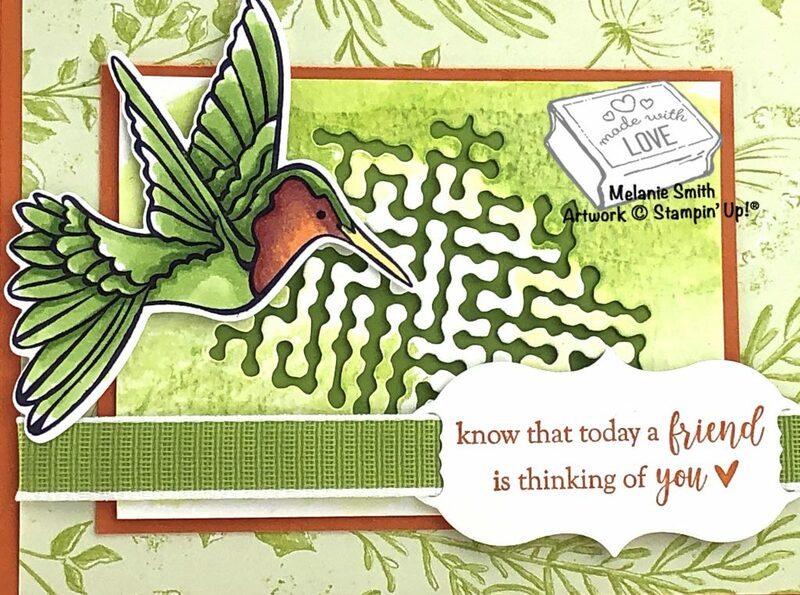 The ribbon in this card is perfect for weaving behind this sentiment die. I have used the 1/2″ Textured Weave Ribbon. 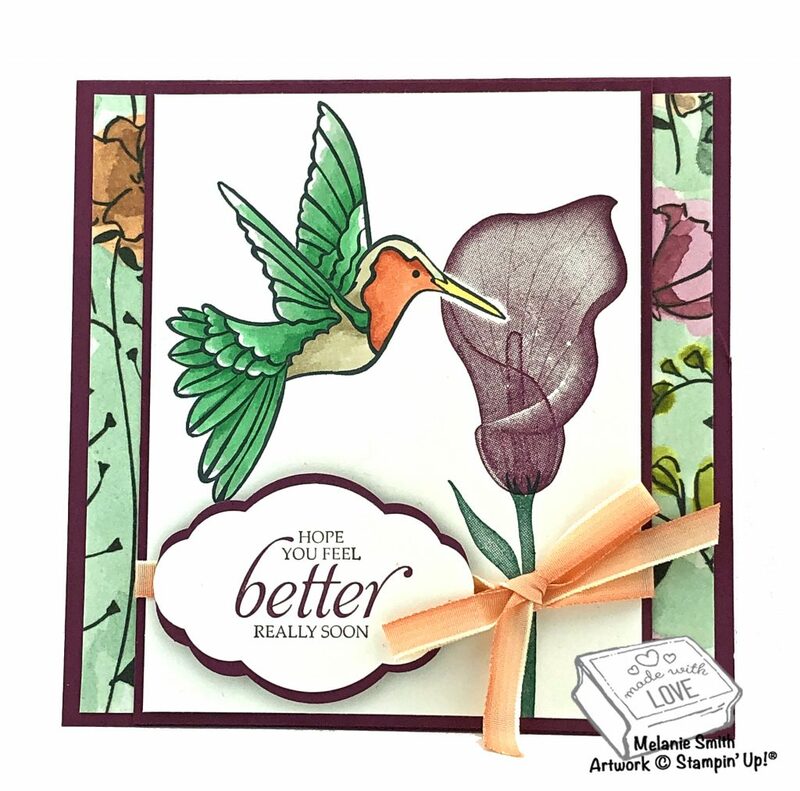 Check back each day this week as I share 4 other samples using this Humming Along Bundle. I have a focal imagery to share with you this week and I hope it helps inspire your next project. Make sure to check back each Friday for a new focal photo, or simply sign up for my email notifications so you never miss a post again. 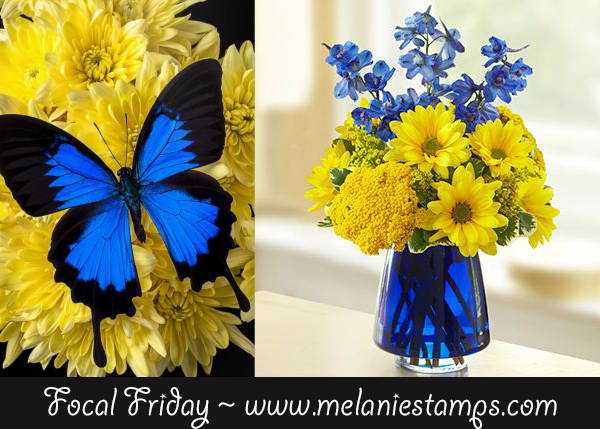 Blue and yellow have always been a favorite color combo of mine so I put together a beautiful image for all of us to use as inspiration. Here is my finished project…. 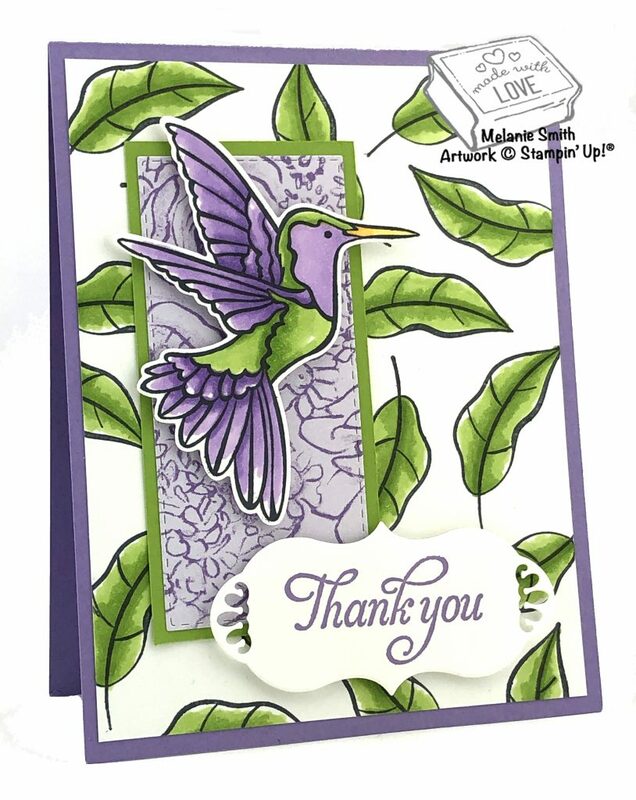 Today I am sharing two cards with you that both have lots of layers and dimension. Some people love the clean and simple look but I am more of a details girl so I love to add layers and contract for added interest. 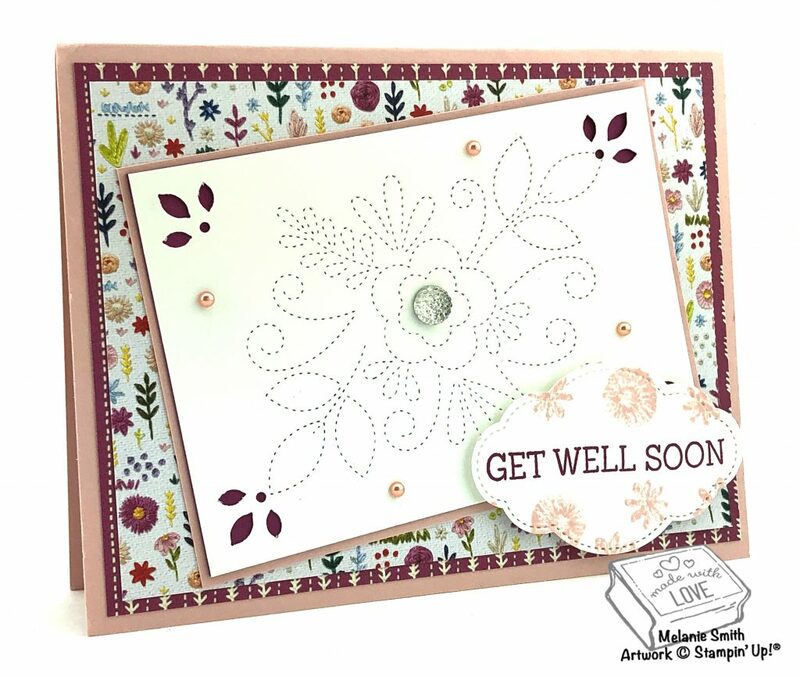 The Needlepoint Designer Series Paper was used for color inspiration for this card. I simply chose two coordinating solid colors and began layering. 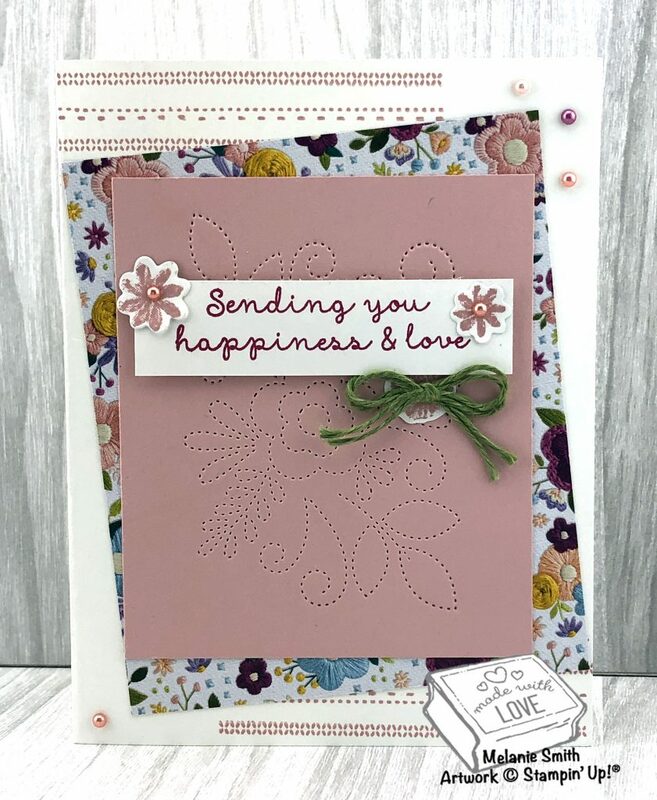 For the card base I choose Berry Burst which was ran through the Big Shot using the “Dot To Dot Textured Impressions Embossing Folder” which immediately added texture and interest. Then Tranquil Tide was used for framing as well as embellishing. 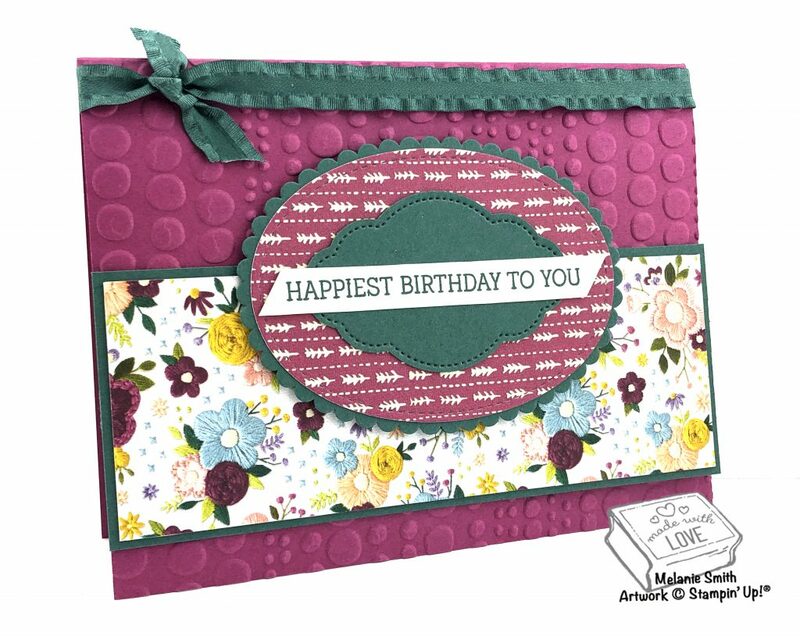 For added interest I used lots of layers including the stitched die that coordinates with our “Pretty Label” punch. I just love the coordination between these two products. Check out the products listed at the bottom of this post for all the product photos and links for more information. Now onto the second “Lots of Layers” card…. 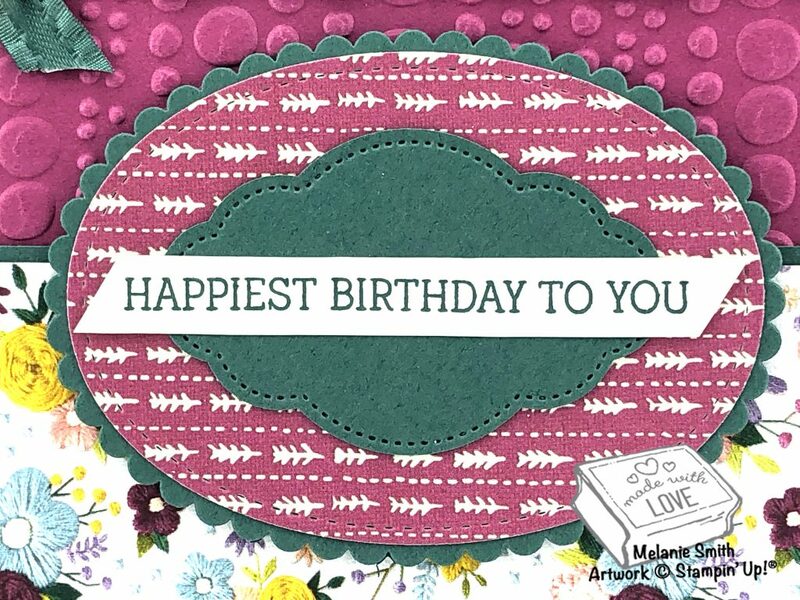 For this card I simply layered up two different patterns of paper from the Needlepoint Nook designer series paper. 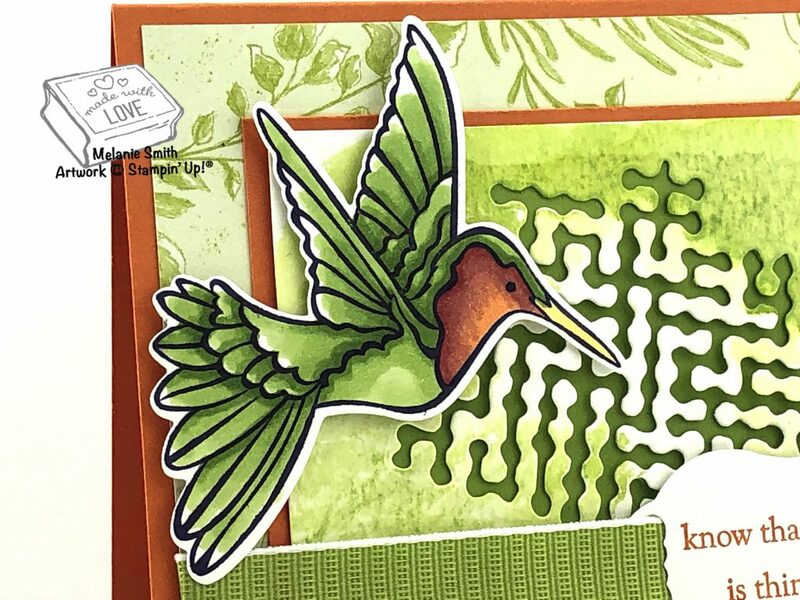 I then used the stitched background die from the Needle & Thread bundle as the focal image. The corners of this piece was cut using the detailed trio punch. 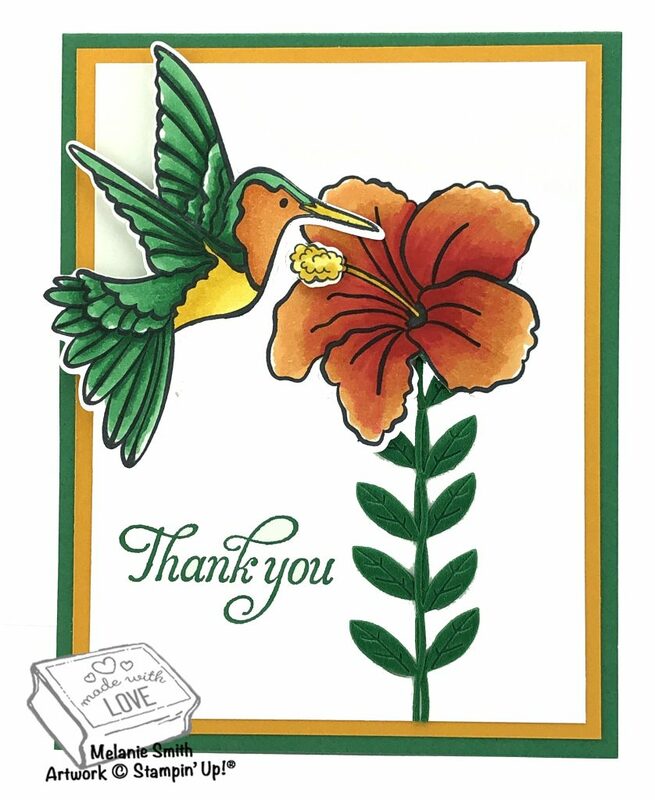 The sentiment again was created using the die/punch as used in the first sample. 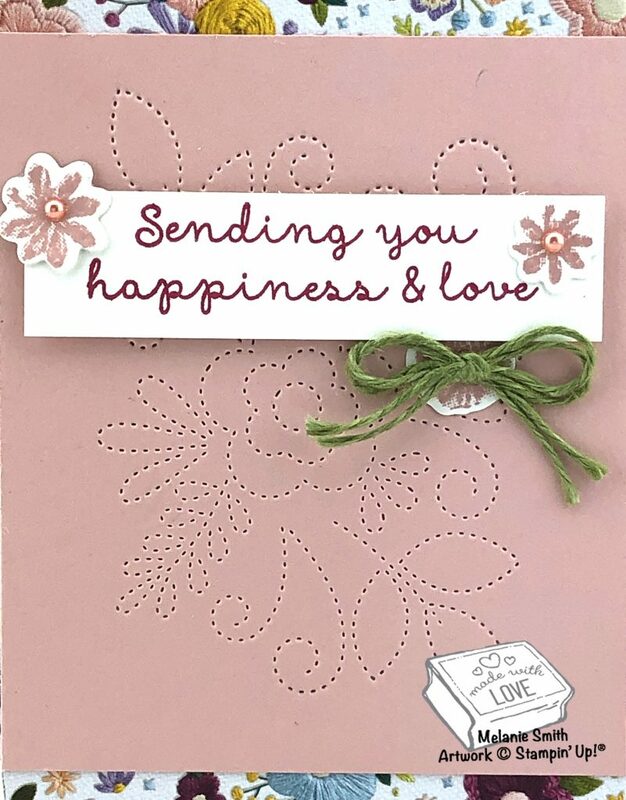 I just simply added some stamped flowers on it using blushing bride ink and stamps from the Needle & Thread stamp set. I believe mid week we should all be able to still create even though our time is limited. 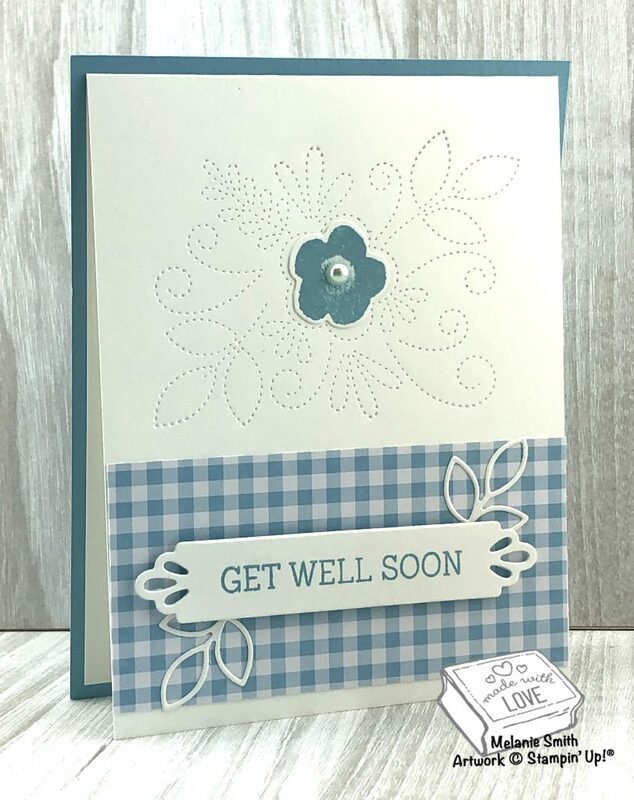 Today’s card is a get well card. 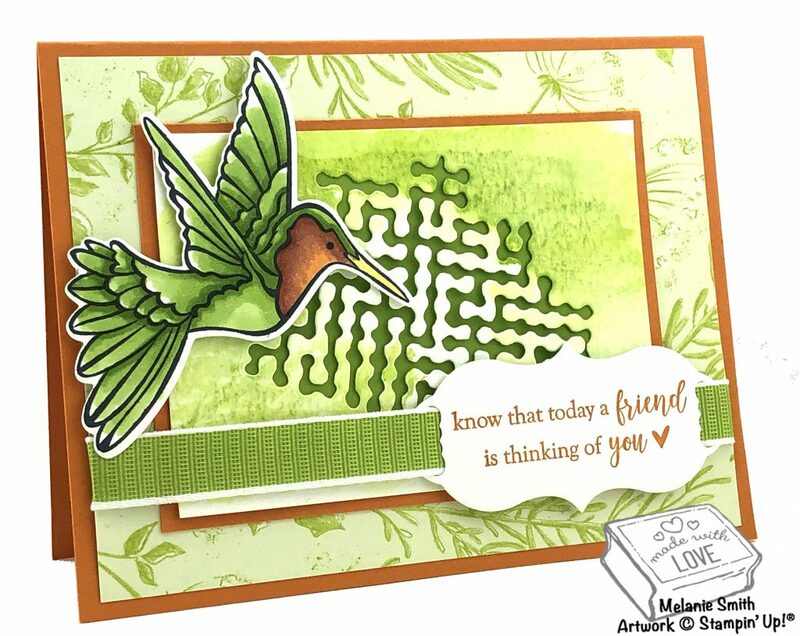 A couple runs through your Big Shot machine plus 2 stamps and here you have today’s CAS card. Isn’t the stitching from the background die just beautiful? 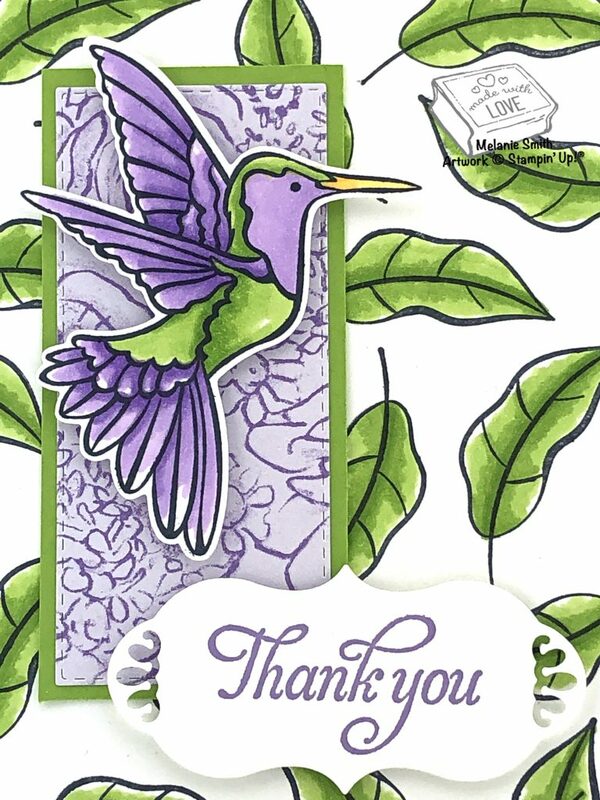 If you have any mid week time I hope to inspire you to create even the easiest of cards. Feel free to share your creations over in my Customer Facebook Group. 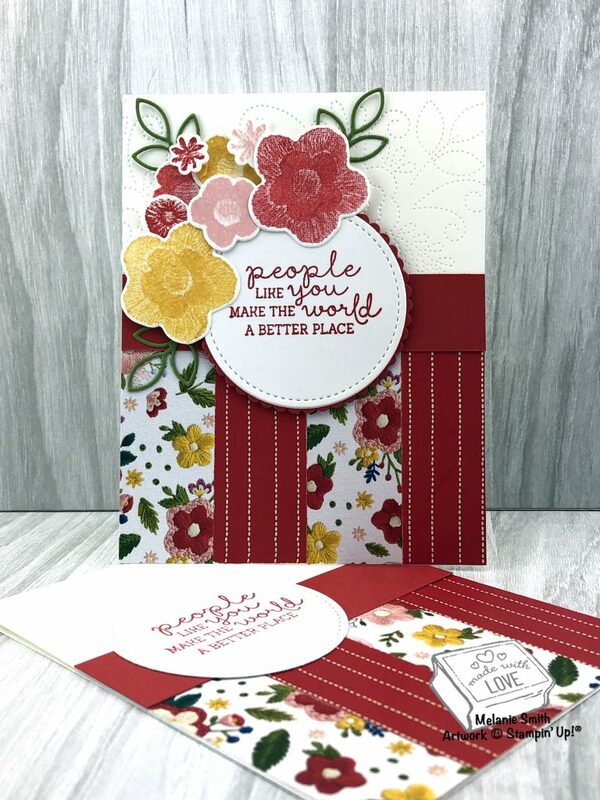 Today I am here to share a Clean and Simple (CAS) card with all of you but I decided to also share tips on dressing up a card with added layers of detail. I hope you have enjoyed this and feel inspired. The CAS card has sleek lines and is quite striking due to its extra white space and the ‘dressed up’ card has dimension and extra interest. Both designs will appeal to a wide variety of people. Now lets see a CAS & ‘Dressed Up” card that you have designed. CLICK HERE to head on over to my VIP Customer group on Facebook. Feel free to SHARE your personal projects. I Can’t wait to see them. Welcome back to a Melanie’s Must Have Monday. 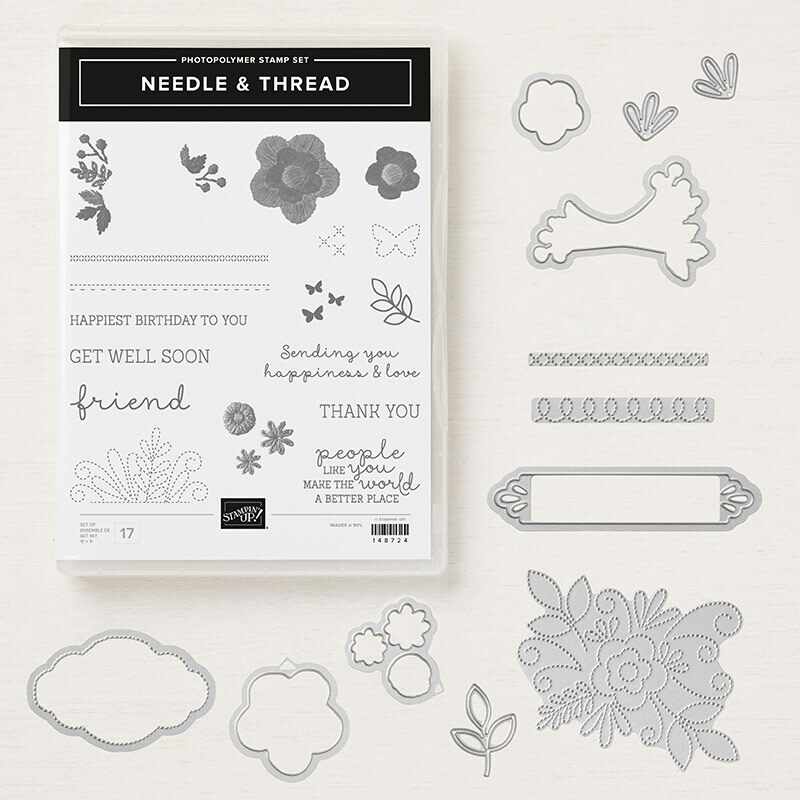 This week we will bhe playing with the super fun Suite called Needle Point Nook Suite of products which includes the Needle & Thread Stamp & Die bundle along with coordinating paper and embellishments. Lets take a look…. This suite offers a wide array of coordinating products. 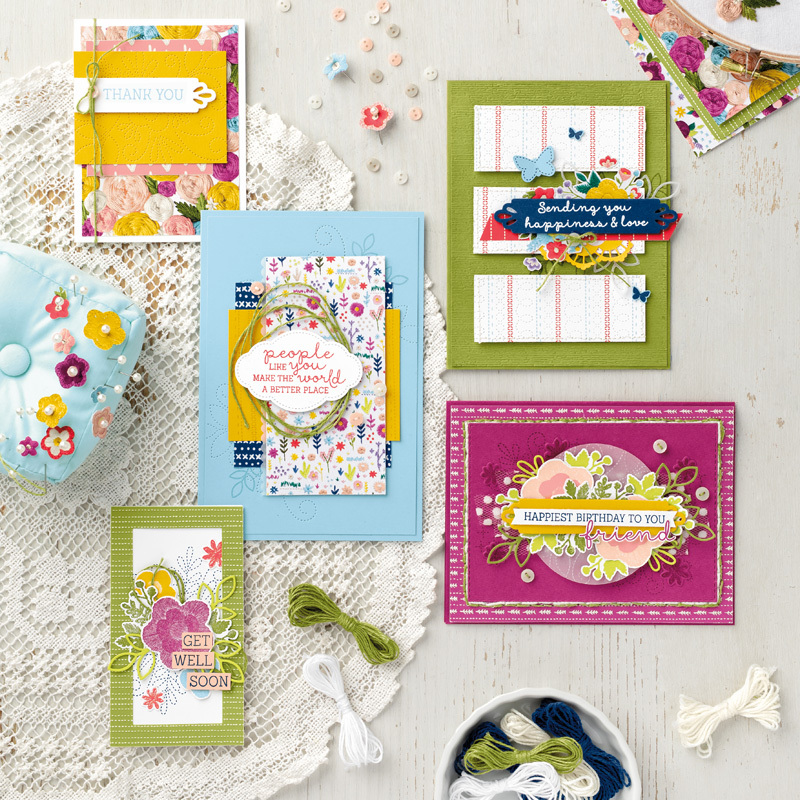 This is perfect for all your crafty friends. I love all the layers that can be created with this collection of products. 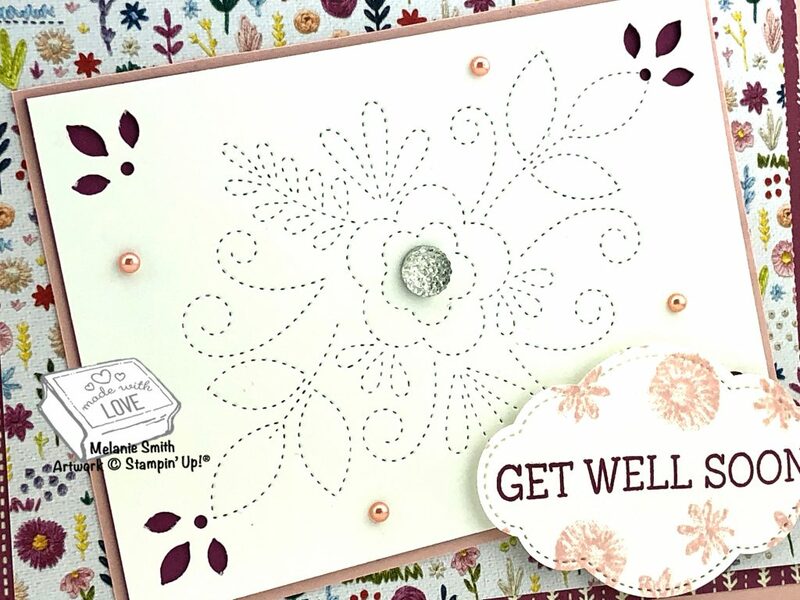 My first sample here shows lots of elements from this suite including the Stamps, Dies, Designer Series Paper, and the Old Olive Linen Thread. All these items will be linked up below for easier shopping. Just look at the detail. 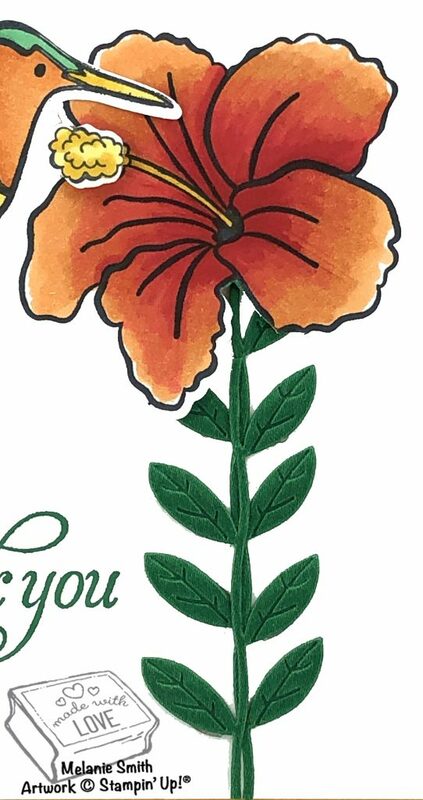 The background stitched die leaves an authentic stitched design into the fabric…I mean paper. It makes the paper look as if it has been quilted. Just beautiful! I hope your Monday is a beautiful one and that you will stick around all week long as we explore so many projects featuring this Needlepoint Nook Suite of products.